Summary: We skied a magnificent and stunningly scenic route crossing 9 of the 12 glaciers on Mt Adams, covering 20.1 miles with 6600 vertical feet of ascent and descent in 12.5 hours. Traveling counter-clockwise starting and ending at a camp near 6150 ft just SW of the former Timberline Campground, we were able to ski or skin about 99% of the total distance, except for a few bare glacial moraines and ridges. Snow conditions were mostly excellent, well-consolidated and supportive, with fine corn snow for much of the route. However, along the western portion of the route, there was some notable instability, with several loud whumps of settling weak layers, one of which remote-triggered a moderately large slab avalanche about 1/4 mile away. Other moderate slabs which had run earlier could also be seen near the route, although none entrained more than the several inches of recent surface snow. 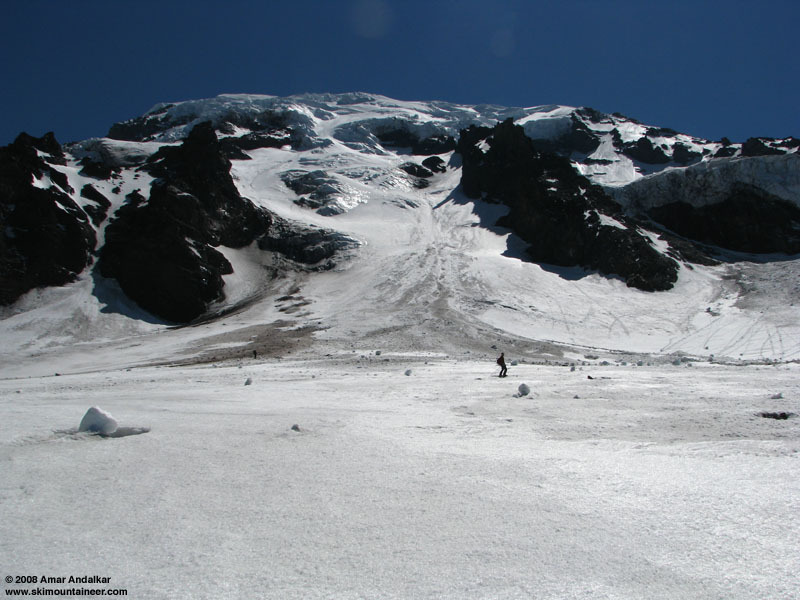 Details: Dave Coleman and I had been thinking about this route on Mt Adams for several years, and had discussed it numerous times with Jason Hummel and Lowell Skoog, who had both also long been interested in doing this trip. Since 2005, Dave and I had skied over 60% of it together in three separate chunks, resolving several of the possible routefinding issues. I had soloed a couple other sections of the route over those years, bringing my total up to about 75% of the route. It only remained to put it all together in a single trip. Conventional wisdom for the route held that it covered over 30 miles and dictated a multi-day trip, perhaps 3-4 days with heavy packs and moving camp each day. Our plan was quite different: use skis, stay high, shorten the distance to under 20 miles, and pull it off in a single long day in well-consolidated spring conditions. 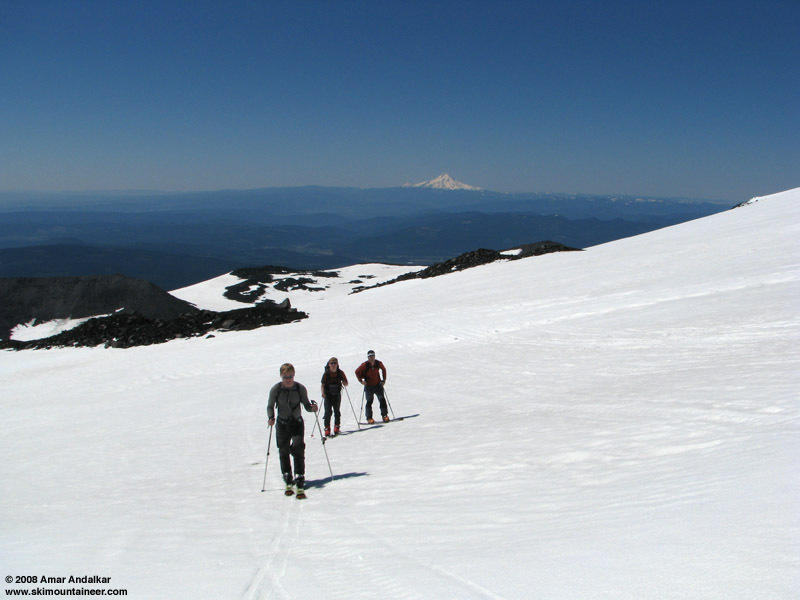 Our first attempt to implement this plan in late May of 2007 failed miserably, due to a lack of sufficient fitness on my part and sufficient snowpack on Mt Adams' part, and we pulled the plug after only 20% of the route. Following the storminess and winter-like snowfall of early June 2008, a sudden weather window appeared with several days of warm dry weather forecast from the 12th onward, and it seemed like the ideal time for another shot. The June snowfall had been very heavy on Mt Rainier, about 40" at Paradise, but we suspected (correctly, it turns out) that Adams had likely received only a fraction of that amount due to its location farther south and east. The few inches of new snow was expected to be well consolidated by the weekend. The spell of warm weather might even finish off the route as a viable ski this year, melting snow-free gaps across the numerous moraines which must be crossed, so it seemed like it was now-or-next-year time. 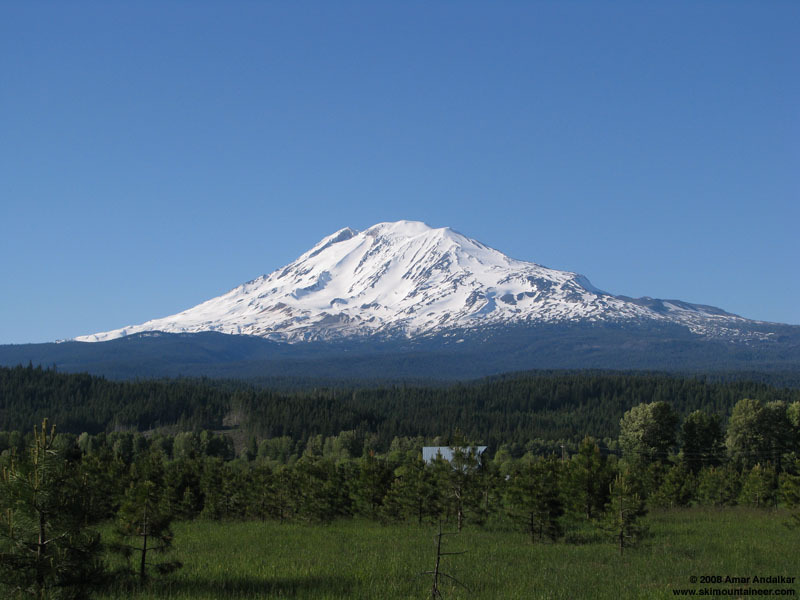 6:20pm on June 13: Mt Adams seen from just west of the Trout Lake Ranger Station. We knew that others had their eyes on this route too, including our friends Jason and Josh Hummel, who have probably skied more different routes on Mt Adams than anyone else. So upon seeing the forecast weather window, we forged plans at the last minute and decided to join forces for our attempt. A long drive from the Seattle-Tacoma area to Trout Lake via I-84 and Hood River took up all of Friday afternoon (June 13) and had us finally heading up FR 8040 after 7pm, eventually being stopped by deep snow patches and a downed tree just after Gotchen Creek trailhead at 4650 ft, about 3.5 miles from Cold Springs. 10:00pm on June 13: Time to set up camp at 6150 ft.
We hiked from the car at 8:15pm, and skinned up from just before Morrison Creek CG on what seemed like continuous snow. But as usual, several parts of the road have melted out completely where it crosses steeper south-facing slopes, and we ended up skinning across a lot of dirt, mud, and gravel before some of the party decided to head more directly up the slope on foot. We eventually regrouped higher up the road and continued skinning up past Cold Springs, setting up camp at about 6150 ft just SW of the former Timberline Campground after 10pm. 7:40am: Up, up, and away. We took a leisurely start the next morning, not wanting to encounter hard-frozen snow on the first part of the route, and skinned out from camp at 7:40am. We decided to leave our glacier gear and all bivy equipment at camp, except for a single canister stove and a shovel. Going light would be the key to successfully completing the route in a day, and we anticipated no crevasse issues on those parts of the glaciers which we would be travelling. The early portion of the day went very slowly, as the intense sun and already-warm morning was quickly taking its toll, resulting in several lengthy breaks to melt and drink additional water. Three hours out from camp, we had completed not even 20% of the route before reaching the first major ski descent, and it looked like we might be in for a VERY long day and well into the night. 10:30am: Traversing a glacier on Mt Adams, with Mt Hood in the distance. We had crossed several hundred feet of bare moraine on foot during the initial long traversing ascent, and then had a short climb up about 100 ft of another moraine in the middle of the first ski descent. Then another short climb, no more than 50 ft, and afterwards we would be on skis for the next several hours, ascending on skins to our high point at a 8440 ft saddle and then descending the lower portion of the Lyman Glacier on skis to reach the roughly half-way point of the trip by 3:15pm, after about 7.5 hours of total time. The next gently traversing ascent would be done without skins, as the snow had softened enough to provide sufficient traction, across the Lava Glacier followed by a bare crossing of the toe of the North Cleaver on foot near 8100 ft.
3:00pm: Crossing the lower Lyman Glacier. A brief angling descent led onto the lower piedmont portion of the Adams Glacier, followed by another skin-less traversing ascent up to 8000 ft, and then another descent-ascent to reach and cross the lower Pinnacle Glacier. Numerous loud whumps had been heard during these skin-less ascents, causing us a bit of pause but no serious worries as we were always on relatively gentle, almost flat slopes. While traversing such a gentle slope near 7800 ft just north of the Pinnacle Glacier, we got our biggest surprise of the day: we remotely triggered a moderately large slab at 5:15pm, as a very loud WHUMP underfoot caused the simultaneous release of a slab about 1/4 mile east and hundreds of feet above us, on a 40+ degree steep west aspect above 8000 ft. The slab was several hundred yards wide and ran downslope several hundred feet, although we were much too far for any accurate estimates of its size or crown. 5:15pm: The remote-triggered slab avalanche. Certainly a bit spooked and more cautious about the slopes we were traversing, we forged onward, since the way ahead continued to cross mostly gentle terrain as we held near 7500 ft. A few steeper bowls on the slopes below the White Salmon Glacier produced more whumps, but no more slabs or sluffs or instability. We were finally making good progress, the terrain on the western flanks is almost trivially easy with adequate snow cover. We lucked out with a several moraine crossings which barely connected on snow, these are sure to melt out soon, and managed to continue without skins all the way to the western moraine of the Avalanche Glacier, where skins were helpful for the two AT skiers up a�short 300 ft ascent of a snow slope providing passage through the moraine (the two telemarkers managed without skins). 7:15pm: Something is looking good for tomorrow . . .
By now it was after 7pm, and the snow was becoming refrozen and crusty on shaded aspects, while remaining soft on parts still in the sun. A quick schuss on refrozen snow down and across the bowl at the foot of the Avalanche Glacier and Southwest Chutes brought us to the standard exit, and we traversed high from 7100 ft, ascending again without skins on the mostly sunny slopes to reach a 7400 ft crossing of the ridge just west of Crescent Glacier. From here, we knew it was all downhill back to camp, and that success was assured. We zoomed into camp at 8:15pm, exhausted, hungry, dehydrated, and with very painful feet for some of us, but all of us riding a huge high after completing a long-sought goal. And we didn't even need to use headlamps! 8:10pm: All downhill back to camp. Dude, what do you do for a living because I want to do that. I definitely ski vicariously through you. And it's awesome. I had a good trip Amar, Dave and Josh. I really love this mountain and enjoyed getting up on it. What, no pictures of your feet?!? That was an epic Cascade thrashing - like someone hung you guys upside down & whipped your ankles with a leather belt, a bloody mess! Amar and I definitely favored much better in that arena, although my downhill small toe was well bruised & beaten by the time the weekend was done. You guys are animals! Nice work! I'd say your skied elevation for the weekend is pretty noteworthy! And again, great pics! Dave, the feet are healing. Ha. What a sunny-nice, fantastic weekend. Too bad this one isn't as good. Great tour and great TR's Jason and Amar.� I have really enjoyed following your exploits this season.� Your excellent photography helps me to feel like I came along with you.� Keep it up. Thanks for the kind words Stugie and SnowBell. Much appreciated.